Faucet manufacturer Grohe says its newly redesigned Lineare Collection of modern faucets is available to the U.S. market for the first time. The brand says the harmonization of the cylindrical shapes and thin rectangular forms results “in design flexibility for anyone who desires highly inviting soft or edgy aesthetics in their bathroom,” the company says. 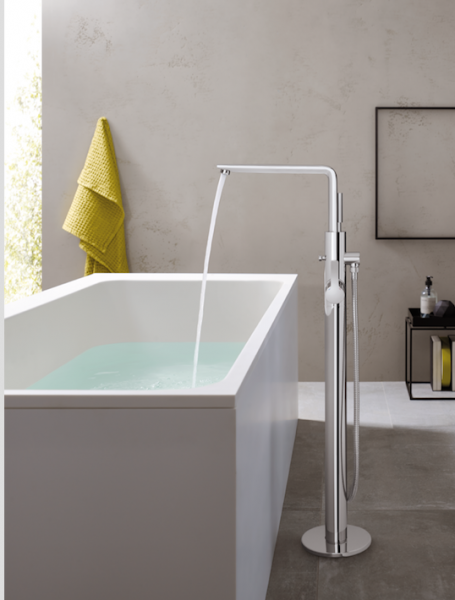 Lineare Collection offers the slimmest body available from Grohe. Inspired by the modern aesthetic of architect Mies van der Rohe’s Farnsworth House, the faucet offers a minimalist aesthetic featuring softened corners and smooth contours for user-friendly ergonomics and greater comfort, Grohe says. The collection features a broad range of options, including extra-small, small, and large-size centerset lavatory faucets; a widespread faucet; shower trims; and freestanding and roman tub fillers. Product finishes include StarLight Chrome and Brushed Nickel Infinity Finish. Lineare products feature PVD Technology that produces a surface three times harder than stainless steel finishes and the company’s QuickFix components that cuts installation time by 40 percent.